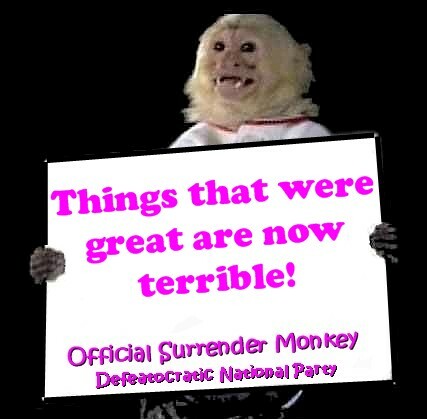 It’s the long awaited return of the Official Surrender Monkey Of The Democratic Party, and he and his friends will be highlighting all things surrender and nutty in the Democratic Party. Times were much different when he and his compatriots roamed the Internet, as it would be considered raaaaacist to use them while Mr. Obama was in charge. And, what does he come back to? While Wall Street celebrates yet another stock market record — surpassing 20,000 on the Dow Jones industrial average — many Americans have little reason to cheer. Despite the spread of 401(k) retirement plans, the wealthiest 10 percent of households own roughly 80 percent of stock market wealth. The Dow’s 23 percent surge over the past year has benefited mostly investors who were already well-off. The rising concentration of wealth at the top is one reason why the economy’s significant gains since the Great Recession ended 7½ years ago haven’t been felt by many Americans. Though the Dow more than doubled in President Barack Obama’s two terms, pay growth was stagnant, especially for people without higher education or high-tech skills. Discontent and anxiety about the economy’s direction helped fuel President Donald Trump’s election victory. Now they tell us that things weren’t that great and the stock market was not that big a deal? Really? Now, a major challenge for Trump is to help extend the economy’s gains beyond wealthier households and those in thriving large metro areas to struggling regions and many rural areas. You can tell that the media Narrative is shifting in order to Blame the wishy washy economic conditions on Trump. There will be no “inherited from the previous administration” notion. The idea here is exactly the opposite of Obama’s time: what they made look great during his time will be made to look bad in Trump’s. When the first jobs report comes out, if there is slightly good news, Obama will be praised. If there is slightly bad news, it will be blamed on Trump. Heck, if there is any good news the Media Industrial Complex will find a way to complain about Trump. What they do not get is that Trump is not Bush, who they tried this on and succeeded. Trump will not lay down and let them run roughshod. He will fight back. He has zero problem naming names. The tactics he used during the primaries and general election cycle will apply now. They’re in for a long, four, and possibly eight, years.